Much as we would like a smooth car transfer, things don’t always go our way. When your vehicle reaches its destination of transfer, you usually expect it dent and scratch-free since it is rare to have these after choosing a reputable car transfer company. Who knows what happened during the ride? Damage has been done but how do you handle the damages you see during car shipping Australia? Car transfers often have similar steps and responses, but they work differently, the process can vary. The first thing you do after finding out about the damage is to call the transport company. You only have 30 days to file a claim, no time to waste or wait around. Complaint on damages after 30 days can’t hold the carrier responsible for any dents or scratches. The representative will then take note of the complaint and help you with the steps. Keep track and follow up on the next steps. Document the damage immediately on the Bill of Lading or B/L. It is a document that is used all over the globe by carriers of cargo to confirm that it has been received and to be transported to a specific place for delivery to the consignee. It serves as a legal contract between you and the carrier of the car. If in any case, the cargo has been damaged, the Bill of Lading will be important to claim against the owner of the ship or your insurance company. Make a thorough description of it and be sure that the driver understands that the damages were not present before the car transport. Both of you will sign the Bill of Lading to acknowledge the presence of the damages and the vehicle’s true condition at the time when it was delivered. The verification will be through comparison of the original Bill of Lading and the inspection report. After contacting the representative, the transport company will communicate with the carrier responsible. Typically, the damages will only need minor repairs and can be easily handled by the carrier. However, damages needing large repairs could take longer since the insurance company if the carrier will be involved. Having liability and cargo insurance is required by the law for car shipping Australia and other car transfer companies. This is to ensure that your car damages will be covered. The insurance agent will inspect the damage and proceed to prepare an estimate of the price. The insurance company will then begin processing the claim for the damage/s. Do remember to wait for their approval and authorisation before getting your car repaired in an auto shop. Get your car repaired and wait to be compensated. 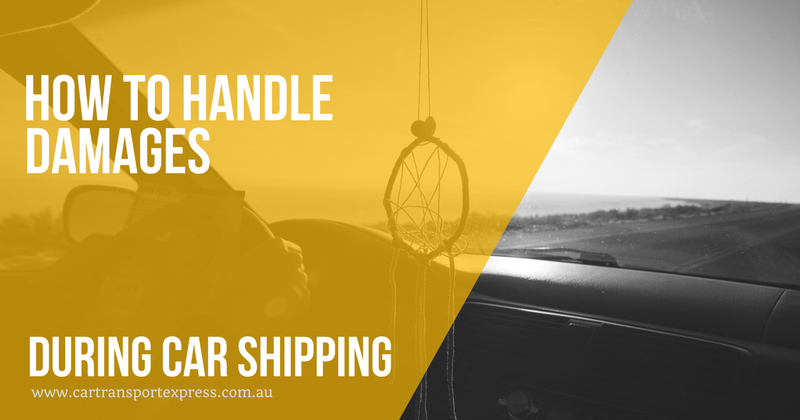 As long as you documented the state of your vehicle prior to car shipping Australia, you need not worry. The insurance will take care of it, and you can start driving it back on the road when the repair is done.